It was a sad sad day a few months back when Google announced they'd be retiring Google Reader from their Skynet-sized roster of resources. While I haven't a clue what brought about the decision (I certainly used it, did you? ), I've since been idling on where to transfer my RSS subscriptions. There are any number of options out there (Feedly was recommended to me), but for now I've opted to run with a service this very blog has previously pulled readers from, and which possesses a glossy, user-friendly feed to help smooth out the already tough transition: Bloglovin'. If this is sounding like a big plug for Bloglovin', I'm afraid it's far more self-serving than that. I wish Bloglovin' encouraged me to do this, but I totally just want to keep seeing people. Whatever your method, as the change comes, I'm hoping not to lose all of you quiet but present repeat visitors. Bloglovin' has been working for me thus far, but if you've got a method you prefer, I'd love to hear it. Digg will have a Reader replacement soon, as will many others; Pulse and Flipboard seem to work for some (though I find the latter glossy but claustrophobic). Anyhow, follow Love & Squalor on Bloglovin' by clicking here. Download the free iPad app by following this link. Already following! 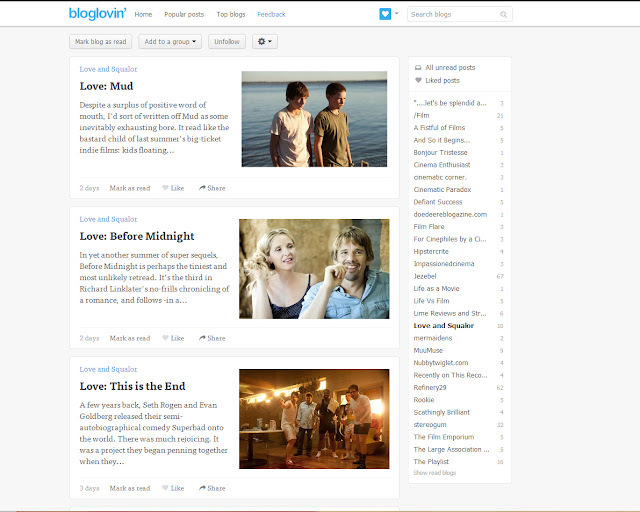 I'd certainly like to see more movie blogs on bloglovin', it would be nice to use it for more than fashion websites. I agree. The style bloggers dominate that site! It would definitely be great to see more sites featuring real, written content. Reading=fundamental.